If you’re looking for a great little time waster game, but something that can keep your brain working then you should check out Spell Well by Visc, Inc. In this simple game, you have to guess the correct spelling of a word out of a selection of four, with each level consisting of five sets of words. If you choose the wrong spelling of the word you’ll lose a chunk of time and have to start again at the beginning of the set of five. You also have a timer for each level, so the quicker you do it in, the greater your score. Obviously the higher the levels go, the harder the words get, and the more trickier the options are to choose from. 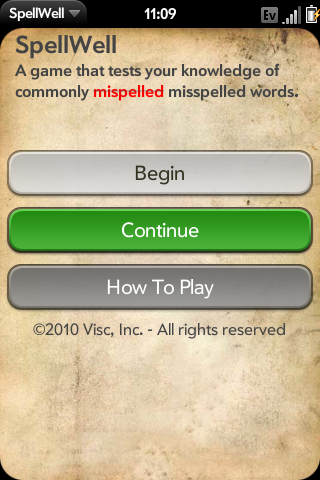 I personally just found it quite an interesting little game, and even though I thought I’m pretty hot on spelling, it caught me out on a good few occasions and made me realise how much I probably rely on spell check these days.